According to the OED, the phrase ‘title-page’ was born into English about 1600. Scholar Michael Saenger promotes the use of ‘front matter’, a catch-all phrase that encompasses title-page, epistles, dedicatory verse, and others, including the frontispiece. At this time of book production, ‘front matter’ not only advertised the book, increasingly a commodity, but it also gave readers entrée into the text. The frontispiece portrait of a rather casual James Howell (1594?–1666), an Oxford-trained historian and political writer, invites the reader into his work. It was engraved by Claude Mellan and Abraham Bosse and first prefixed to the French translation and printing of Howell’s Dodona’s Grove (1641). Its later use raises a question of plate ownership. 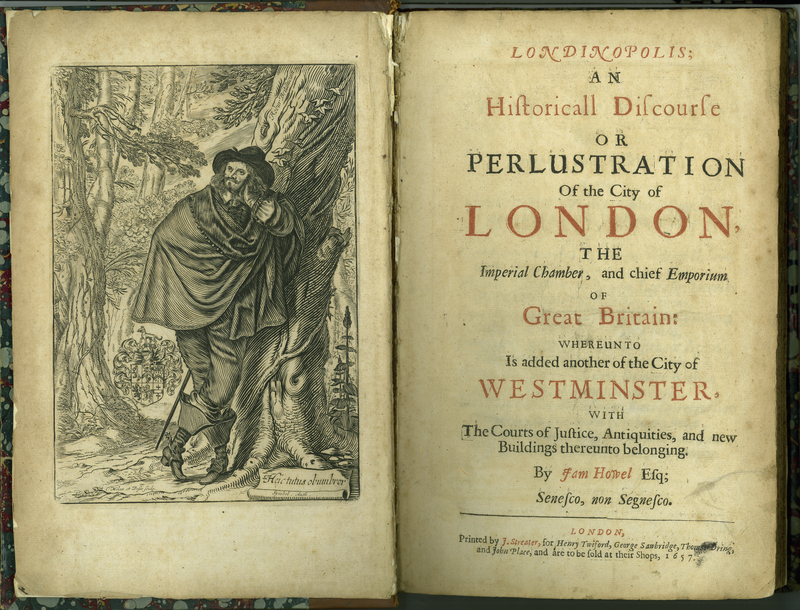 James Howell, “Londinopolis; An Historicall Discourse; or, Perlustration of the City of London,” ourheritage.ac.nz | OUR Heritage, accessed April 26, 2019, http://ourheritage.ac.nz/items/show/10647.